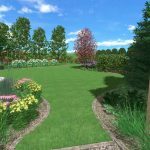 Your idea of landscaping for your grandchildren probably includes having a play and lawn area for running around and sports, as well as the usual goals of having a beautiful and low maintenance landscape. Those goals are no longer enough….not if you care about what your grandchildren will be inheriting. 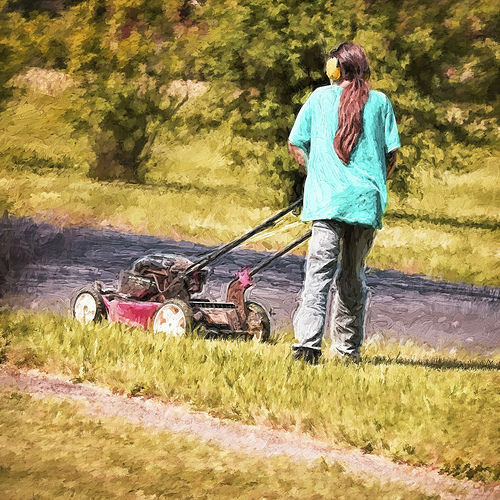 We are borrowing the land from future generations, even that yard you think is yours and yours alone, so you are indeed landscaping for your grandchildren whether you think about it or not. What you do with your property matters because climate change and the extinction of species matter. I am sure you are aware of climate change. Most recent research indicates we are running out of time and have about 20 years to fix it or face very dire circumstances. You may not be as aware we are in the worst species die-offs since the loss of the dinosaurs 65 million years ago. 1,000 to 10,000 times the normal rate species go extinct. When enough species go extinct, ecosystems cease to function and collapse. This is not to be taken lightly. Just looking at food, about 35% of the world’s food crops depend on pollinators. From pollination of our crops by insects to flood control to storage of carbon by our forests, Ecosystem services are estimated to contribute more than twice as much to human well-being as global GDP. That is worth repeating, nature provides us with more than twice of what all the economies of the world provide. For free, I might add. And YES, your yard does impact our climate and the preservation of biodiversity. It is up to YOU how? Conventional landscape design, construction, and maintenance practices are no longer enough. But in some ways, they are way TOO much. 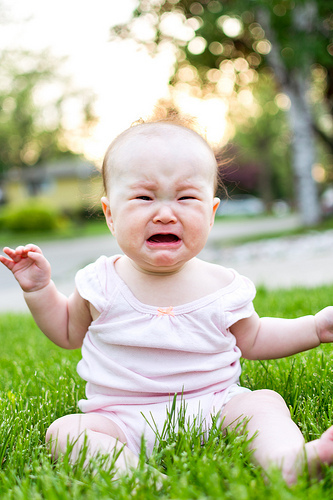 Consider lawn fertilizers. Maybe you know if used improperly fertilizers can pollute our yard, creeks, rivers, and drinking water. But have you ever thought about how much energy is used to create them? The production just the nitrogen portion of the fertilizer requires approximately 25,000 BTUs per pound of nitrogen. That does not even count the phosphorus, potassium and other ingredients in that lawn fertilizer. That energy creates greenhouse gases that contribute to global warming. No, changing what is in your individual yard will not solve either climate change or the mass extinctions we are causing. But in the same way that one soldier enlisting in the army in 1941 did not stop the Third Reich, you can be part of the solution. Today, we need that kind of effort. The good news is you don’t have to risk getting shot or even abandon the goals of creating a beautiful and low maintenance landscape. They can go along with these new goals of solving climate change and species extinction. OK, so let’s get started with three things you can do to start making your yard part of the solution. 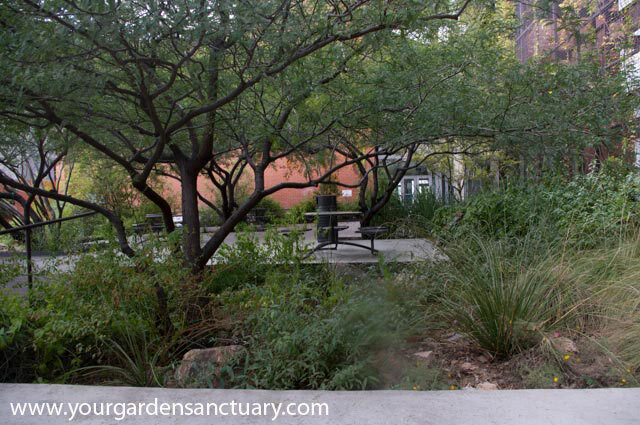 An attractive and sustainable desert garden in Tucson in the dead of winter at the University of Arizona. Perhaps you have heard about scientists trying to invent these machines that pull CO2 out of the atmosphere and pump it deep into the ground or otherwise capture it. 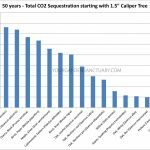 Then they talk about the cost and energy it would require to build the thousands or millions of them that would be needed to make a difference in CO2 levels. It seems to me we already have these, they are called TREES! Why not put one in your yard or better yet, several. Reforestation can happen one yard at a time. Site trees on your property to reduce your homes energy needs as well. In most cases, a spot close to your house on the Southwest side of your house will block the hot afternoon summer sun. How close should I plant a tree to my house? Consider that 96% of nesting birds feed their young moths or caterpillars. You might think that planting exotic plants that have fruit helps birds. Some may help them by providing fruit for energy before they migrate but that is no help for them in raising their young. For instance, a single pair of breeding chickadees must find 6,000 to 9,000 caterpillars to rear one clutch of young, according to Doug Tallamy. 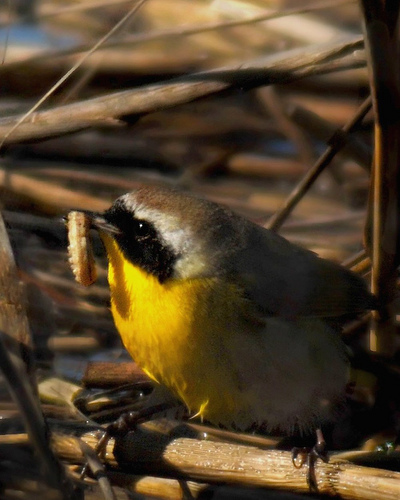 It’s not just the baby birds either that like insects, 80-90% of an adult Carolina chickadee’s diet is spiders and insects (butterflies, moths, caterpillars, leafhoppers, wasps, bees, ants, aphids) from spring thru fall. In winter about 50% of their diet is seeds and fruits – best provided by native plants. When selecting native plants, choose ones that lots of different native insects will feed on. These “high value” native plants will create a variety of insects that other wildlife will feed on. Don’t worry about a little insect damage to your plants. That just shows your plant is doing its job. Native insects rarely do extensive damage to native plants. The birds usually will prevent that. In fact, research shows that the plants will even “tell” the birds to come and eat the bugs. It seems when plants are in being fed on by insects, they can send out sensory cues that that alert organisms such as birds that they are in need of help. Read more here. When you do see a lot of insect damage on plants it is usually exotic insects feeding on native plants or native insects feeding on exotic plants. I should add, don’t use insecticides on your native plants. The point of your plantings is not only to look good but also to support wildlife, not kill it. If you can’t stand the thought of having insects in your yard, sell your house and move to a condo. That or go to the Petstore and buy a bunch of hornworms and feeder crickets and play with them until they become your friends. Inside Bringing Nature Home by Doug Talamy, he gives lists of species that support the most caterpillars. To create the highest environmental benefit we should select for our landscape “high value” native plants near the top of the list. Here are the top 4 from the perennial section. 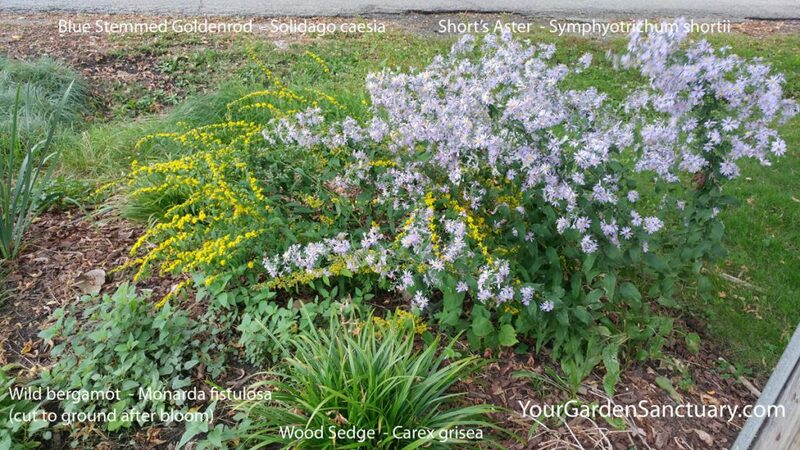 Two of the highest value native perennials for wildlife together in my yard, Goldenrod and Aster. 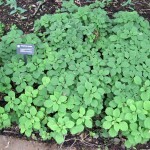 The Sedge and Bergamot are also native and great wildlife plants. Several species of skippers feed on our native sedge and the Wild Bergamot is just a monster pollinator magnet. Do you have a plastic plant in your yard? Native Plants of the Midwest Book Review. It has very good photos and information for the gardener. Plant native Trees, with native shrubs underneath them, with native perennials around them, with native groundcovers around them. There is a lot more room for plants in your landscape than you think. The more natives you plant the better, but even non-native plants can contribute to the physical structure that is needed for your garden. Wildlife needs different layers to live in. In my area, there are not many native evergreen shrubs. Even adding a mugo pine can add a structural element to the landscape that helps wildlife. In this case, birds can use them in our winters to seek protection from the wind and cold. In a forest, some wildlife species use the ground layer plants for food but need the tree layers for shelter. 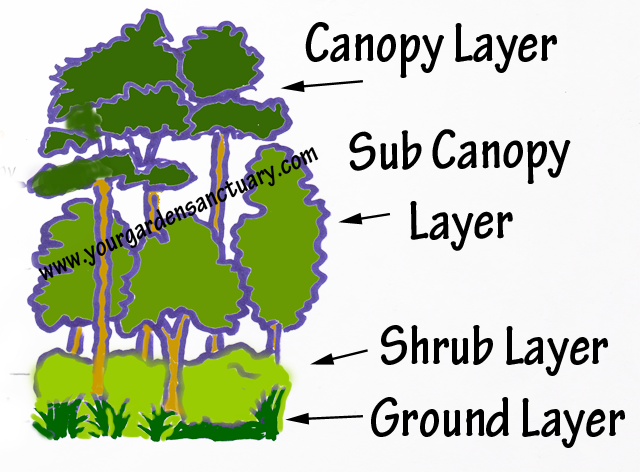 Others will live in the shrub layer. If you follow nature’s lead by planting in layers, this will allow for the different feeding and nesting habits of many species. These layers also allow wildlife to safely move around. If you want to read more about this idea of layers (and idea #2), I recommend Doug Tallamys book The Living Landscape, see my review here. It’s a great book. Or you can just wait for my next post. There I will take the idea of landscaping for your grandchildren to create a garden bed design that includes carbon sequestering machines (long-lived shade trees), brings life to our yards using extremely wildlife-friendly native plants arranged in maximum wildlife-friendly layers. Not only will it look nice and be low maintenance, but it will also do our part to fight climate change and the 6th mass extinction and maybe give your grandchildren a world as blessed as the one you inherited. Thank you for posting this! I too am concerned about climate change and its affects to our environment. 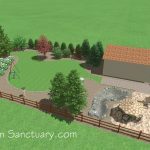 I have been following your blog for a few years now and it has been helpful reading your blog posts on important things to consider and think about when planting trees and shrubs and other plants in our backyard that is both beautiful in all seasons yet will help support the wildlife. We started with a blank canvas as we live in a new subdivison, however planting mostly native species and watching everything grow, we’ve seen so many birds and other critters frequent our backyard compared to other neighbours. So thank you! Thank you for this post. Lots of great info and links, as usual. 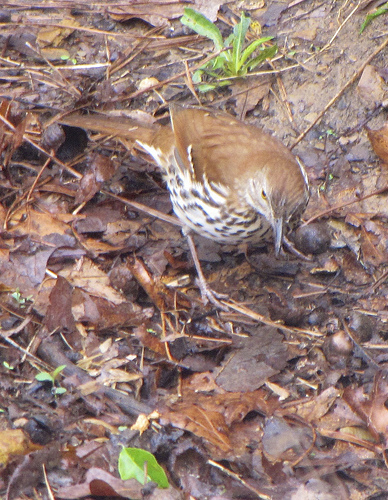 It’s because of your blog that my yard is becoming more and more ecological.